Four outstanding business leaders have been honored by the Maryland Association of CPAs as Maryland’s “Women to Watch” for 2018. Jill Gansler, CPA, chief financial officer of Regional Management, Inc., and Heather Latham, CPA, CFP, CGMA, director of accounting and finance for R&F Metals, Inc., have been honored in the “Experienced Leader” category. Meanwhile, Maxene M. Bardwell, CPA, CIA, CFE, CISA, CRMA, director of internal audit at the Washington Suburban Sanitary Commission, and Ebony Hypolite, CPA, a manager in SC&H Group’s Business Performance Management consulting practice, have been honored in the “Emerging Leader” category. 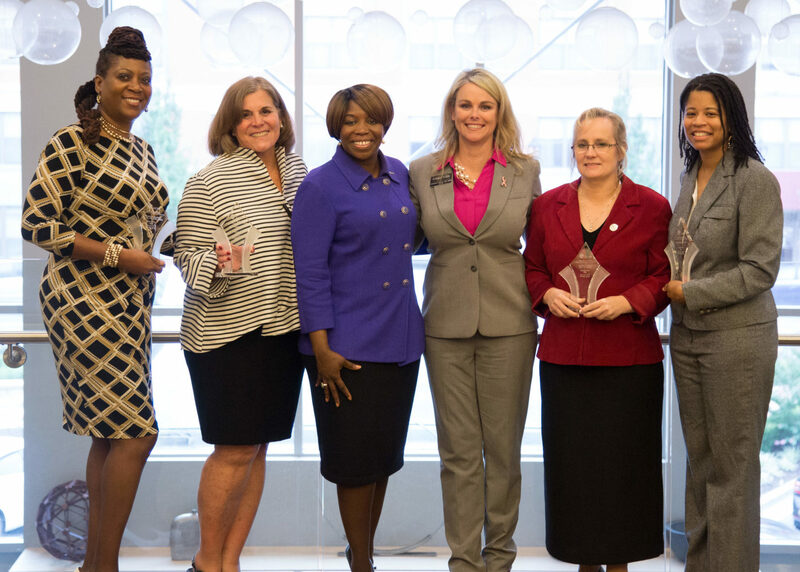 Pictured in the photo above are, from left: Bardwell; Gansler; Kimberly Ellison-Taylor, immediate past chair of the AICPA’s Board of Directors, who keynoted the event; MACPA Board Chair Samantha Bowling; Latham; and Hypolite. Maxene M. Bardwell, CPA, CIA, CFE, CISA, CRMA, is the first female director of internal audit at the Washington Suburban Sanitary Commission. She leads an audit team that saves the commission millions of dollars each fiscal year. Maxene possesses numerous certifications and is a member of several professional organizations. She is an avid volunteer and ethics commissioner for the City of Laurel. She earned her bachelor’s degree from The Ohio State University and a master’s degree from Notre Dame of Maryland University. Maxene originates from Hartford, Conn., and resides in Laurel, Md. Ebony Hypolite, CPA, has a strong passion for serving others in her professional and personal life. She is a manager in SC&H Group’s Business Performance Management consulting practice, where she helps organizations transform how they forecast and analyze results through technology implementations and process re-engineering. A proud alum of Stevenson University, she established the Ebony Hypolite ’06 Annual Scholarship for juniors and seniors. Ebony pays it forward with the hope that the recipients of her giving will do the same. Other nominees in the Emerging Leader category were Samantha Barlow of PWC; Christy Bennett of Qual-i-Tax, Inc.; Ashleigh Hall of WithumSmith+Brown; Lisa Johnson of Gross, Mendelsohn & Associates; Norah Jones of Councilor, Buchanan & Mitchell; Sabrina Lamb of Legg Mason; Rose Lambert of Gorfine, Schiller & Gardyn; and Christine McCoy Reed of Ernst & Young, LLP. Jill Gansler, CPA. Her current position is CFO of Regional Management, Inc., but Jill’s professional experience includes more than three decades of corporate finance, tax, governance and oversight; internal auditing; personnel administration; portfolio management; general accounting, and commercial lending. Her extensive local and national civic volunteerism includes entrepreneurial experience in successfully founding and incubating both service and fundraising programs and collaborating on strategic issues and policy execution. Jill’s major strengths include integrity, transparency, and building consensus among diverse constituents, achieving common corporate / association / personal resolutions to pressing issues. Heather Latham, CPA, CFP, CGMA, director of accounting and finance for R&F Metals, Inc. She joined the MACPA in 2005 and served on the board for the MACPA’s Southern Maryland Chapter for 21 years, including two terms as president of the chapter. The Southern Maryland Chapter worked during its final years as a separate chapter to implement mentoring programs in the local community to help new CPAs develop and increase interest in the community to become a CPA. She is also a member of the AICPA. Heather is passionate about helping others succeed and has served her local church to help set up the church records and lead a financial literacy class for members of the church. She lives in St. Mary’s County with her husband and seven of her children. She also has one son who is married and lives in South Carolina with his family. Other nominees in the Experienced Leader category were Michelle Armstrong of Mister, Burton & Associates; Sandi Berger of Brightview Senior Living; Stephanie Drane of Jones Advisory, LLC; Bryna Engel of Rosen, Sapperstein & Friedlander, LLC; Robin Ewers of John B. Barry, LLC; Traci Getz of Ryan & Wetmore; Lisa D. Ingram, CPA; Darlene Siegel of CyberCore Technologies; and Robin Thieme of KBS CFO.